The new chiptune posse on the block, the bad asses of Beep City if you will, have released their first album. Before we get into that though, I would like to explain what the folks of Beep City are all about. Beep City is an interesting blog style site with a smattering of classic chiptunes from decades past, they even go so far as to include cartridge art and game descriptions for the fictional classic games these songs are from. These folks are going the distance in bringing us the long lost soundtracks of yesteryear, and what has been released so far is definitely catchy and nostalgia inducing as all get out. The songs and games include classic titles, such as the frightening 2D classic Terror Tower, the first in the series that spawned one of my favorite games, Terror Tower: Concerto of Darkness for PS1. Included is the stand out track You’ve Been Cordially Invited (To A Nightmare Waltz). From there we hear the crashes and bangs of the song Cave Visitors from Very Quest II: Very Mystic. If you don't remember the game, that's okay, as it had a very limited release outside Japan, and due to poor sales forced American publisher Bigwig games out of business. That was especially terrible to fans of the game, which never saw a sequel in America because of this. Luckily some plucky young coders are translating Very Quest III: Really Very Quest as of this writing. Now get ready to kick some villain faces in the face with Commandude IV Rock's Revenge, and do that face kicking to the hard rocking track The Infiltrator: Spoils of War. My personal favorite is, of course, Commandude II, so here is to hoping they dig up something from that soundtrack soon. I also want to say, this is from a time when all these titles were classic though, before we were inundated with 4 or so games a year on the GBA like Commandude: Internet Battles: Trolls vs Internet White Knights. Now things get creepier with the bloody sideshow of a game, Carnival Carnage. The game boasts a catchy yet creepy funhouse atmosphere in the track The New Funhouse Warriors. I remember how disappointing that "360 degree" level was, which was plagued by so much slowdown and clipping that I couldn't even see what was going on. Who cares about this getting past the censors, how did this get past the debug team?! Good soundtrack though. Had enough yet? Well too bad, because now I introduce you to Mountain of The Gods. The action packed puzzle game that has it all. Action, puzzles, you name it. If it's action you want, and puzzles you crave, this game is the one for you! And you will be listening to the amazing track Crucial Fight – Volcanic Peak for your troubles as well, you adventurous puzzle master. The site has only been around for a very short while, but just recently they have gone from releasing fantastic singles, to uncovering and releasing their first full release. 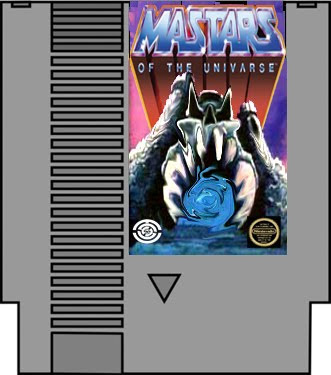 I introduce you to the classic unlicensed game from Temp Sound Solutions studios and Beep City's first full soundtrack release, Mastars of the Univarse. Here is the official release info below. Imported from the shores of Eternia and harnessed from the power of Castle Grayskull, Beep City has formed an alliance with one of chiptune’s eldest warriors, the renowned Shawn Phase of Temp Sound Solutions, to bring you a sampling of beats and bleeps from the history of his home land. The digital folk songs presented tell a tale of heroes and villains, locked in an eternal struggle for control in a world of colorful characters, fiendish beasts, and a big, gay, green cat. The album is a collection of rough and tumble tracks. We kick off with the overtly glitched out opening track Battle Cat Causing A Muckus (which I hear may have been a demo track from when the sound team was first reverse engineering the 2a03 sound chip, which they then decided to keep in the game afterwards). Then we get the adventurous bleeps of the main theme Mastars of The Univarse. The soundtrack is a crazy fusion of rhythms and styles, possibly due to the fact that reverse engineering for this illegal game gave developers a different perspective in their music creation. Moving on, Teela's Shattered Feelings is a low ambient trek through ominously empty caverns, while Orko's Sick sounds like a glitchy version of soft item shop music. The final two songs are the funky, fast psychedelic shoot em up sounds of Mastars of The Univarse (reprise) which spans an amazing six minutes. This leads into Greyskull, the final foreboding theme to this games soundtrack. So there you have it! Nostalgia and music combine to make an amazing site for fans of classic games. Be sure to keep an eye on the amazing Beep City for all sorts of forgotten classics and their soundtracks in the future!